After graduating from the Design Academy Eindhoven in 2000, Marije Vogelzang developt a new direction in the design profession. After founding PROEF in Rotterdam in 2004 and expanding to Amsterdam in 2006, she broadens her experiments and develops her vision one food. She travels the world for inspiring lectures about her work and vision, in which she researches the potential of her new approach to eating (or is it a new approach to design?). Marije Vogelzang's lectures are well received in the Netherlands and among others, Cape Town, Beirut, Bangkok, Dubai, London, Hong Kong, Tokyo, Norway, Romania, Berlin, etc. In addition, Marion is also part of brainstorming sessions and works as a consultant for the food industry. Studio Marije Vogelzang is a small personal company with big ideas. they work both on restaurant concepts and do hospitals and medical projects. They do community projects such as workshops to inspire, but they also work for the food industry. 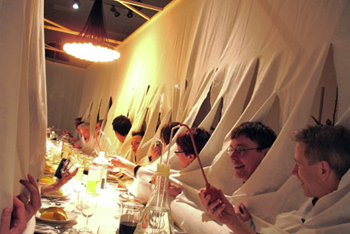 They create art installations and new rituals concerning food.